The Narragansett turkey is named for Narragansett Bay in Rhode Island, where the variety was developed. It is the descendent of a cross between wild turkeys and domesticated breeds brought by settlers from colonists in the 1600’s, likely Norfolk Blacks. 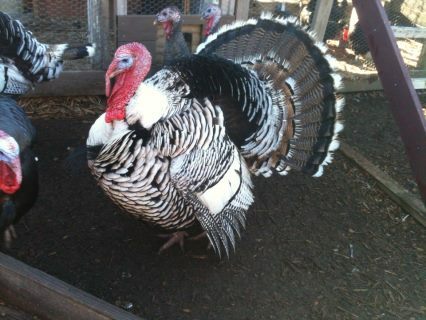 Selectively bred to improve and standardize the breed, the Narragansett was the foundation of the turkey industry in the New England states, being especially popular in Rhode Island and Connecticut. The American Poultry Association recognized the Narragansett in 1874. According to an 1872 account, it was not uncommon to find flocks of one to two hundred birds, the product of a breeder flock of a dozen hens. The breed was prized due to their ability to flourish on range as they scavenged for grasshoppers, crickets, and other insects and required little supplemental feed. Narragansetts can run and fly well, preferring to roost in trees at night. While never as popular as the Bronze variety, Narragansetts were kept throughout the midwest and mid-Atlantic states and New England. Around the 1900’s, the breed began to decline as the standard bronze became more popular as a commercial breed. More recently, consumer interest in preserving biological diversity and fitness has renewed interest in the breed, creating a growing niche market. Narragansetts come in a patterned combination of black, gray, tan, and white with their patterning similar to the Bronze breed. White wing bars are commonly seen in the breed, but only appears on those bred in the United States. The beak is horn colored with a red to bluish white head and black beard. The shanks and feet are salmon colored. A female turkey is called a hen; a male turkey is called a tom. A hen typically weighs 14-18 lbs, with toms weighing around 23-33lbs. Hens lay eggs once per year between February to April. They lay 10-12 eggs in a clutch, which will hatch in 28 days.